Until now, spreadsheets have been used as the principal means for communicating the product structure. It's not that Excel is very good for comparing bills of materials, it's just that there's been nothing better. Since BOM spreadsheets are commonly used within your supply chain, accuracy and completeness are essential. Finding all revised data in a multi-level BOM is equally critical. Comparing BOM changes isn't the same as comparing product changes. What's better than a spreadsheet for product data? Fortunately, there's a standard file format that provides all of this information. The IPC-2570 Supply Chain Communication (PDX) standard specifies a Product Data eXchange file (a "PDX package") that includes the complete product view: parts, BOMs, documents, design files, change notices, supplier contacts and a host of other useful information. 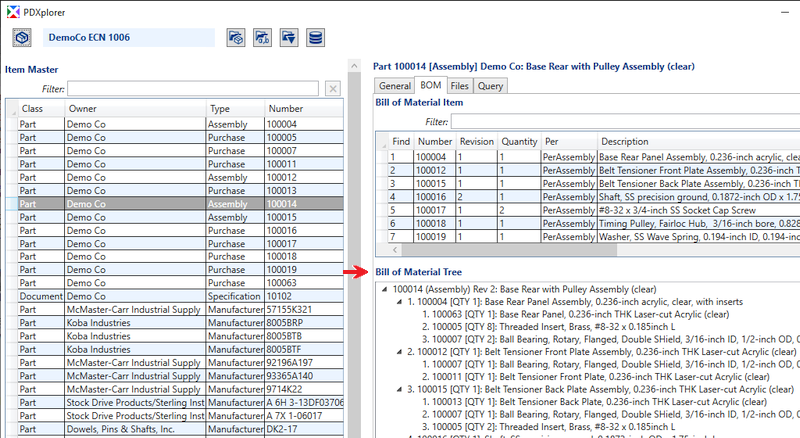 PDXplorer Viewer provides a simple way to navigate, view and export product data contained in PDX packages. And our PDXplorer Viewer allows easy PDX file comparisons for identifying changes to individual items and BOMs. Completely FREE to download and use — for all of your supply chain partners. Simple operation: just export a PDX package from PDXpert or any PLM/MRP that supports the PDX format, and open it with PDXplorer... no reformatting, data crunching or cut/paste required. Comprehensive product data: parts, BOMs, sources, document references, file attachments, material composition, custom attributes, change forms. Industry-standard file format is vendor-neutral and application-independent. Intuitive product structure navigation, with Back/Forward "breadcrumb" buttons. Side-by-side data comparisons, with differences Highlighted. Launch file attachments for viewing by simply clicking the hyperlink file name or web link. Export files individually or within any navigation tree group. Select rows or entire grids to copy data into email or other software applications. User interface can be tailored using XML-based configuration files. Run on your local PC, and avoid the slow performance and security risk of cloud-based tools. Export items, BOMs, sources and other user-defined data in Excel-compatible CSV text files. More than two PDX files can be compared: matching Owner / Type / Number for revision changes, or isTopLevel=Yes for non-interchangeable part changes. What's better, Excel+BOM spreadsheet or PDXplorer+PDX package? Compare the data in any BOM spreadsheet to PDXpert's IPC-2570 implementation. There's simply no comparison!